While I am on vacation, I want to fill your potential TeaBeans void with some craft-related blogging. Above we have four sketches personally picked out by Iron Martin as his favorites from a book I made him which was a calendar countdown until he moved to New York with me. The book includes collage, watercolor, stickers, games, etc, but he liked these colored pencil sketches the best. 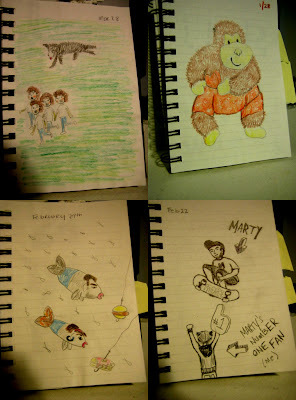 Clockwise from top left: A border collie herding our "curlies" (our future kids that will have sprouts of curly hair and tons of energy); a portrait of the stuffed monkey he got me for our first Valentine's Day together; Marty doing a stalefish and me cheering him on; me and Marty as fish going after lures of pancakes and a hamburger, respectively. Blogs & Knitting & Shower Curtains, o My! I am not at work! !